Female faculty are rare at African universities, but the Internet helps university women exchange ideas and moral support. It provides what some participants call a "virtual feminist university." When Dr. Sylvia Tamale spoke out a few years ago in favor of gay rights in Uganda — where homosexuality is illegal and regularly prosecuted — the fallout was fierce. Local news media quoted members of the public who said she should be "lynched" and "crucified" for suggesting such a thing. She says politicians, fellow academics, even friends turned against her. "I felt extremely isolated and lonely," says Tamale, 44, who in 2003 suggested Uganda's proposed Equal Opportunities Commission prohibit discrimination on the basis of sexual orientation. But Tamale, a law professor at Kampala's Makerere University, wasn't entirely stranded. For support she turned on her computer and sent e-mails to an online network called Strengthening Gender and Women's Studies for Africa's Transformation, or GWS-Africa. About 200 academics are subscribed to the list, and members use it daily to announce job postings, report on emerging issues on the ground, profile women's achievements or, in Tamale's case, save morale. Tamale reported what she was going through and in response, she received messages of solidarity from feminist academics and activists across Africa who had met through the African Gender Institute (AGI) at South Africa's University of Cape Town. "Most of the support and encouragement that I received came from sisters at the AGI and the broader GWS-Africa list serve," she says. "The AGI introduced me to a network of feminist scholars around the continent that have served as an invaluable support base in my intellectual and activist work." Women are more visible on African university campuses than a generation ago, but Tamale says universities remain male-dominated and male-structured. That can be particularly true in sub-Saharan Africa, where 20 million girls are denied any education due to discrimination, poverty and conflict, according to a 2005 Save the Children report. While there are no continent-wide figures on women's representation at universities, post-apartheid South Africa is widely agreed to be a Mecca. But even there, senior women faculty are scarce. At Johannesburg's venerable University of the Witwatersrand, for instance, women accounted for only 19 percent of associate professors and 17 percent of full professors in recent years, according to Dr. Hilary Geber, a professor there. In South Africa, female faculty of color are particularly rare. At the University of Cape Town, women account for 35 percent of the school's overall academic staff of 779. But only 59 — or 8 percent — are women of color, according to Nazeema Mohammed, who oversees the school's transformation from the apartheid system. But women say representation at universities is just part of the problem. "Obviously, concerns about simply getting the numbers of African women into higher education — as both students and staff — are critical, and a first point of advocacy," says Lynne Muthoni Wanyeki, former executive director of the African Women's Development and Communications Network — known as FEMNET — a collective of African women's organizations in Nairobi, Kenya. "But the insufficient support for the production, dissemination and use of African feminist knowledge and theory, in all fields, is surprising." Groups such as the African Gender Institute are using technology as a major tool to overcome those hurdles. 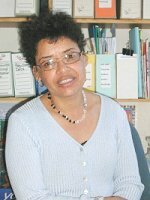 Dr. Elaine Salo, a senior lecturer at the African Gender Institute, says online connections to other female thinkers and advocates helps make up for the camaraderie that's often lacking for women at African universities; it's a loneliness that may lead many to leave the continent to pursue graduate-level studies. "The Internet and technology play a big role in breaking the isolation," says Salo. "We are doing work here that will result in a generation of scholars who will say: 'We can do work here that is relevant to our society.' 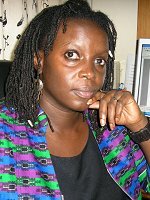 "
Tamale became involved with the African Gender Institute in 2002, when she attended a workshop of African feminist scholars to assess African teaching and research in gender and women's studies. Later, she took advantage of an institute program that offers visiting academics and activists stints of research and writing for a few months at the Cape Town campus. "Most importantly, what the AGI does is give African women academics the chance to meet each other and to work as though their minds are serious," says Dr. Jane Bennett, head of the African Gender Institute. The institute was founded in 1996, two years after South Africa's transition from apartheid to democracy, to expose African researchers and intellectuals to the importance of gender equity and to support those engaged in that process. Housed in offices at the University of Cape Town, it offers undergraduate and graduate academic programs in gender and women's studies. Three core teaching faculty also raise up to $1 million a year from international foundations to offer programs for African scholars committed to gender equity. Through formal instruction, research networks, publications and special projects, the institute regularly reaches hundreds of women across the continent from Ethiopia to Nigeria as well as African scholars in North America and Europe. Academics from French, Portuguese and Arabic-speaking African countries are increasingly collaborating with the group, in which scholars have explored issues ranging from university-based sexual harassment to the lives of urban gay youth in different areas of the world. As in other advocacy groups for female scholars, technology is critical to the institute's work. The African Gender Institute's GWS-Africa project, where Tamale found moral support, aims to be "a completely open-access resource center." On its Web site, women can access papers and presentations, teaching resources and contact information for academic departments and individual scholars. In time, the group wants to post collected works of female African academics in a virtual library. Female academics in Africa also exchange ideas and information through a number of other Web sites such as FEMNET in Kenya, Zimbabwe's Women's Resource Center and Network, Uganda's African Women's Economic Policy Network and Cameroon's Association for Support to Women Entrepreneurs. "There's actually a virtual African feminist university," says Bennett. "It exists in workshops and in conferences and online. It's astonishing how under conditions of deprivation you can make this last." Tamale also began contributing to Feminist Africa, a semi-annual journal the institute has produced since 2002. To ensure as many readers as possible, Feminist Africa is published both as a traditional 150-page academic journal, as well as on a free Web site. It's one of only two English-language feminist journals on the entire continent, alongside the more eclectic quarterly publication Agenda, published by a group of South African women in Durban. Feminist Africa "was a great outlet for me to analyze and document my experience," Tamale says. For now Tamale and emerging groups such as Sexual Minorities Uganda continue to challenge the nation's culture of homophobia. Still, the Equal Opportunity Commission draft bill has not yet been written, and Tamale says there's "no chance that sexual orientation will feature in the bill when it finally sees the light of day." But Tamale has gone far since the public outcry a few years ago. She became the first female dean of Makerere University's Faculty of Law in 2004 and, earlier this year, she launched a research project on Gender, Law and Sexuality, which she hopes will someday become a fully fledged research center. Gretchen L. Wilson is a journalist based in Johannesburg. This article was originally published in Women's eNews, a prize-winning nonprofit daily Internet-based news service which covers issues of particular concern to women and their allies.